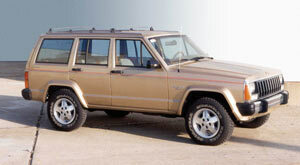 "The spiritual successor to the Cherokee" is what they called the Patriot during the morning walk-around. We were in Scottsdale, Arizona, where seemingly every car is either a restored classic, comes from a luxury marque or is a heavily-outfitted off-road show truck. Our gaggle of media folks from all sorts of backgrounds gathered 'round to hear all about the Patriot and how it would be the next best thing from Jeep. OK, so before we go any further, any of you who believe that a "Jeep" must be able to tackle the toughest trails in the world and should only have "Wrangler" or "CJ" in the name can exit stage left now and save your eyeballs some effort. Still here? Great! Let's move on, shall we? 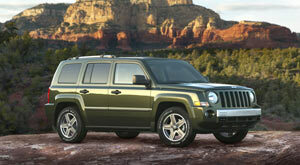 So what does that mean "spiritual successor to the Cherokee?" I think what they mean is that the Patriot holds a position in the lineup once held by the Cherokee - specifically, an entry-level compact sport utility vehicle that seats five and has space in the back to still haul some stuff around. A glance at the Patriot also hints that if the Cherokee were still made today, this is how the shape would have turned out. It's boxy, stretches 173.6" and has a longish 103.7 inch wheelbase. But what really sets the Patriot apart from its competition (think Toyota RAV4, Honda CR-V, Ford Escape) is its rugged appearance and classic Jeep styling. Note the familiar round headlights, trapezoidal wheel openings and seven slot grille, for example. While the competition certainly have their own merits, none of them look like they can go off-road and do the work of heroes. The Patriot does - and it starts at $14,985 (expect top price to be approximately $23,000 or so). But can the Patriot actually do the work of heroes? Stay tuned and we'll find out later. But first, let's have a closer look at what the Patriot's all about. Hailing from Belvidere, Illinois, the Patriot (aka MK74) is built on the same platform as the Jeep Compass and Dodge Caliber. The production line can vary up to 100% of any vehicle, depending on demand. But while it shares a lot of DNA with the other vehicles, the Patriot has some tricks up its sleeve - namely two Off-road packages. Power for the Patriot comes from a standard 2.4L World Engine - an inline four-cylinder with dual Variable Valve Timing (VVT) - which puts out 172bhp @ 6,000 rpm and 165 lb.-ft of torque at 4,400 rpm. 2007 EPA ratings are 26mpg city and 30mpg highway*. An optional 2.0L version is also available and shaves about $900 off the sticker price. Both engines are part of the Global Engine Manufacturing Alliance (GEMA), which is a joint venture, owned equally by DaimlerChrysler, Mitsubishi Motors and Hyundai. The base 2.0L model comes as a front wheel drive with a Magna T355 5-speed manual transmission. A Jatco CVT2 (continuously variable ratio) transmission is standard with the 2.4L (optional with 2.0L), while the CVT2L adds a low-range ratio for the Trail Rated Patriots. To be more clear, the base model is a 5-speed manual and is front wheel drive. The manual is optional with the 2.4L but if you want low range, you can only get it with the CVT2L. There is no transfer case on any Patriot, so while you can get a 4x4 5-speed, you cannot get a Trail Rated 4x4 with Low Range and a manual transmission..
Four wheel drive models come in two flavors, Freedom Drive I and Freedom Drive II. 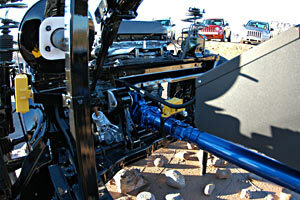 Freedom Drive I allows up to 60 percent of torque to go to the rear wheels when engaged. Freedom Drive II is the Trail Rated version. The CVT2L gets an extra low range of 19:1 when engaged, allowing for a much slower crawl ratio off-road. Available on both Sport and Limited models, the Off-road version also has Hill-descent Control (switchable), brake lock differentials, heavy-duty cooling systems, a three-mode ESP and off-road ABS, extra 3.2mm skid plates, tow hooks and beefed up rear suspension arms. These Patriots also sit 1" higher, have higher differential breathers, more sealant around the chassis, have stiffened suspensions and larger, P215/65R17 all-terrain tires (28" x 8.5" x 17"). - Ground Clearance - 9"
- Water Fording - 19"
Safety is on everyone's minds these days and the Patriot has many features more-often found on higher-priced vehicles, such as standard driver and passenger front and side-curtain air bags (seat-mounted air bags are optional), Electronic Stability Program (ESP), Brake Traction Control, Brake Assist, Electronic Roll Mitigation, ABS with rough-road detection and an available Tire Pressure Monitoring System. As mentioned earlier, Off-road Brake Traction Control and Hill-descent Control engage when you leave the pavement. Cross car impact beams, crumple zones, knee bolsters, structural safety cage, side guard door beams and more also help protect occupants if your day takes a turn for the worse. Underneath, all Patriots come with standard anti-lock disk brakes. 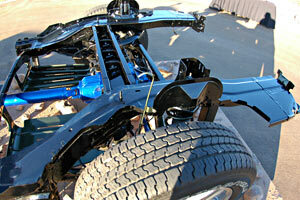 Front suspension is independent with McPherson struts with coil springs over gas-charged shocks. 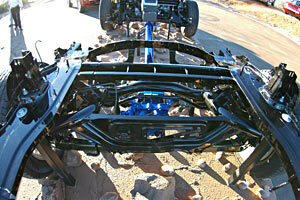 The rear is also independent suspension with coil springs and gas-charged shocks. We spent a wonderful day driving through the desert, passing by the Four Peaks Wilderness Area, the Roosevelt Dam, Tortilla Flats and the Tonto National Monument. 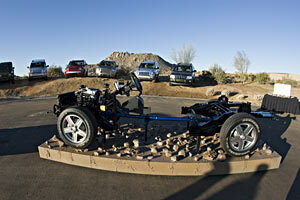 * Fuel economy ratings for 2007 are 26mpg city and 30mpg highway. 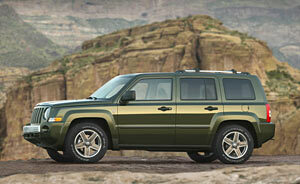 EPA ratings will change for 2008 model year vehicles. The EPA realizes that most drivers get significantly lower fuel economy than the manufacturers claim. The EPA has revised its formulas for ratings for 2008 to better reflect real-life usage. 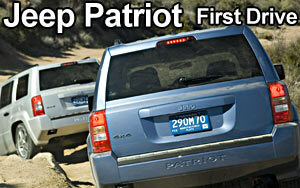 Expect the fuel economy numbers to decrease on Patriot's 2008 stickers. Michael Cohn is the founder and Editor of ROCKCRAWLER.com. Michael has owned six Jeeps but especially enjoys driving someone else's. 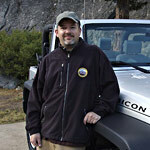 If you'd like your 4x4 flogged, contact Michael at comments@rockcrawler.com.